Regent’s Park is a Royal Park with formal gardens, parklands, refreshment pavilions, tennis courts and a lake. The park has an area of 166 hectares and lies north of Marylebone and southwest of Camden. London Zoo is located in the north of the park and the Grand Union Canal runs along the northernmost boundary. Further north across Prince Albert Road is Primrose Hill which has spectacular views over London. The south, east and most of the west side of the park are lined with tall terraces of houses designed by John Nash. The park is roughly circular with the Outer Circle road circumscribing it. 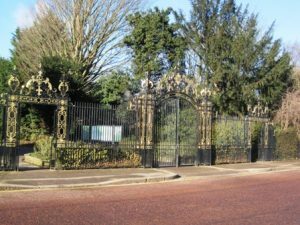 Within the southern part of the park is the Inner Circle road which encloses Queen Mary’s Gardens, these contain formal rose beds and an open air theatre. To the west of Queen Mary’s Gardens is a boating lake. Apart from the two circle roads and two roads connecting them the park is vehicle free.